Our unpunched navy blue regency composition covers from MyBinding are premium grade covers that have the look and texture of real leather. These covers are also referred to as leather flex, leatherette, flexigrain, or leather-like covers. Exceptionally durable, this regency cover is constructed from a heavyweight 16pt coated stock that's 95% recycled material. Additionally, these navy blue covers are fully compatible with all our popular binding styles (see list below) and can be customized with windows, foil stamping, embossing, or even offset printing. Our window covers have a 1.75" x 4" window that is centered on the front cover 3" from the top edge. With over 100 different leatherette covers to choose from, be sure to select the correct size MyBinding cover you need. Thanks for having the supplies for McDermott to order for excellent. This is my second year ordering and last year the quality was excellent but this year we ordered them and a handful of them have a jagged edge and not completely rounded. This is our go to product for consistent, quality presentations. The end result for this is beautiful. I would definitely recommend for businesses that send out a lot of proposals. I like these items. This is my second order because I was just about out of this binder. It is perfect for what I do with it, making booklets to give to customers. Love these, better than the polycovers, and cheaper too! We use them all the time we love it. Products as expected and arrived on time. Welcome to MyBinding video. 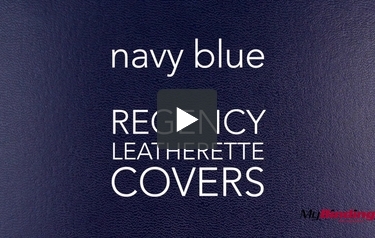 These are Navy Blue Regency Leatherette Covers. They're made to protect your books made with a variety of different sizes. The back of the cover has a matte texture while the front has the look of leather. We also have an option to add a custom window, or using gold or silver foil even add your own logo to the front. Here are a few key words associated with navy blue to help you choose the right color. These are Navy Blue Regency Leatherette Covers. For more demos, reviews and how-to's, go to MyBinding.com.